Critical Thinking Competency Standards provides a framework for assessing students’ critical thinking abilities. It enables administrators, teachers, and faculty at all levels (from elementary through higher education) to determine the extent to which students are reasoning critically within any subject or discipline. These standards include outcome measures useful for teacher assessment, self-assessment, as well as accreditation documentation. These competencies not only provide a continuum of student expectations but can be contextualized for any academic subject or domain and for any grade level. In short, these standards include indicators for identifying the extent to which students are using critical thinking as the primary tool for learning. • communicate effectively with others in figuring out solutions to complex problems. Students who internalize these competency standards will come to see that critical thinking entails effective communication and problem-solving skills, as well as a commitment to overcoming one’s native egocentric and sociocentric tendencies. All students (beyond the elementary level) are expected to demonstrate all of the critical thinking competencies included in this battery of demonstrable skills, but not at the same level of proficiency, or in the same subjects or at the same speed. These competencies signal important habits of thought that manifest themselves in every dimension and modality of learning: for example, in student reading, writing, speaking, and listening, as well as in professional and personal activities. It is up to the teacher or institution to contextualize and sequence the competencies, for different disciplines, and at differing levels. The simple truth is that teachers are able to foster critical thinking only to the extent that they themselves think critically. This may be the single most significant barrier to student achievement of critical thinking competencies. For teachers to aid students in becoming deep thinkers, they must themselves think deeply. For teachers to aid students in developing intellectual humility, they must themselves have developed intellectual humility. For teachers to foster a reasonable, rational multi-logical worldview, they must themselves have developed such a worldview. In short, teaching for critical thinking presupposes a clear conception of critical thinking in the mind of the teacher. 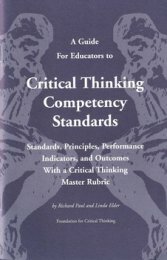 The critical thinking competency standards articulated in this guide serve as a resource for teachers, curriculum designers, administrators and accrediting bodies. The use of these competencies across the curriculum will ensure that critical thinking is fostered in the teaching of any subject to all students at every grade level.